The berries from my seven Haskap bushes were picked. This is the fourth year since planting small bushes. A pound and a half were obtained. The berries had a brix of 13 and were very red inside, a bit soft, some were dropping from the bushes and the taste was slightly tart. I made a blended milk shake of some and that is how the rest will be ingested. My bushes are crowded and held with cages which will be removed for next year’s harvest. There is little to recommend this fruit over blueberry, which will be available in about a month. 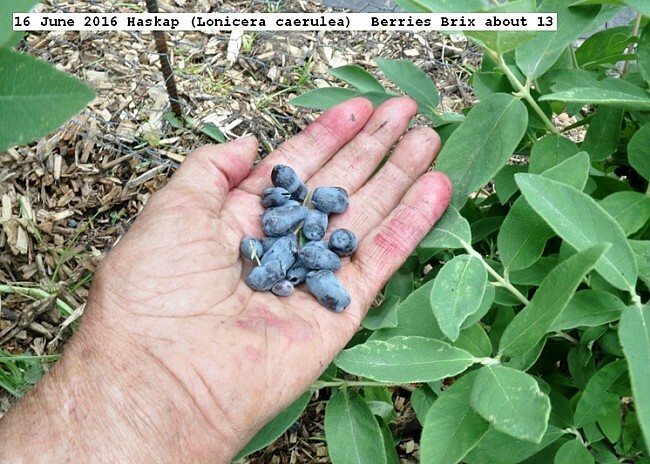 Haskap are the first berry of Spring in my Zone 5 even earlier than strawberries except for the very early ones. The fruit is tedious to pick by hand. This entry was posted in Uncategorized and tagged 16 June 2016 Haskap (Lonicera caerulea), Haskap., Lonicera caerulea. Bookmark the permalink.